Located in Chiang Rai province in northern Thailand, Wat Rong Khun (also known to tourists as the White Temple) is an unconventional combination of Buddhist temple and art exhibit. The privately owned tourist attraction was designed and constructed by owner and artist Chalermchai Kositpipat and opened to the public in 1997. 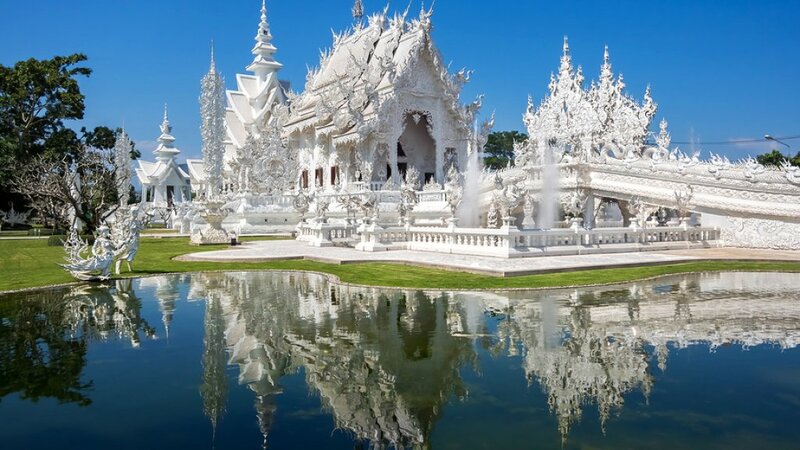 The White Temple Thailand is an unbelievable sight that looks like it has been placed on earth by the hand of a god and yet it was designed and built by man. However it is divine inspiration that encouraged Chalermchai to create the temple as an offering to Buddha thereby granting him immortal life – or so he hopes. The local artist is believed to have spent a total of THB40 million (approximately AU$1,516,430) on rebuilding the temple and plans to create areas around the temple that will showcase the benefits of Buddhist teachings including meditation and learning. While work continues on the masterpiece, it is open to the public all year round with free admission. The White Temple is famous for its iconic, intricate details as well as some distinctive design elements such as the Bridge of the Cycle of Rebirth, the Gate of Heaven, the Ubosot and the Golden Building. The Bridge of the Cycle of Rebirth is a small bridge that crosses a lake to reach the main building of the temple. Hundreds of hands reach out from the front of the bridge and symbolise unrestrained desire. According to the bridge, happiness is achieved by forgoing greed, temptation and desire. The bridge is also flanked by two elegant Kinnaree, Buddhist mythological creatures which are half-bird half- human. Upon crossing the bridge, visitors reach the Gate of Heaven which is guarded by creatures who represent Rahu and Death, the deciding fates of the dead. There are also several meditative images of Buddha represented in front of the Ubosot. The Ubosot is the main building of the temple and the all-white structure is inlaid with spectacular fragments of reflective glass. Embodying classic Thai architectural design, the Ubosot features an abundance of Naga serpents and a three-tiered roof. The Golden Building stands out because of, as its name suggests, its golden colour. While the Ubosot represents the mind, the Golden Building represents the body. The ornate decoration that adorns the Golden Building symbolises people’s focus on money and worldly desires. This building represents the merits of focussing on the mind rather than material possessions.